John Deere added the HH20C, HH40C, HH60C and HH80C hydraulic hammer attachments to its Worksite Pro attachment lineup. 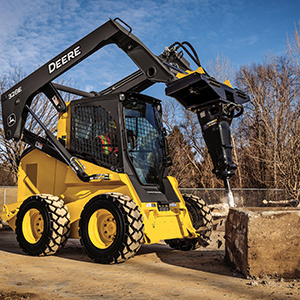 The hydraulic hammers are designed to work with select John Deere G- and E-series skid-steers and compact track loaders, G-series compact excavators and most competitive models. With 30 percent fewer parts, rebuild times are reduced to one hour versus eight hours, and an exclusive tool retention system enables quick installation and removal using only one small screwdriver, the company said. The hydraulic hammers require grease every two hours of operation and have a 1,000-hour service interval. Optional pyramid point used to break hard, reinforced concrete as well as sediment (only available on the HH20C and HH40C). The new attachments are backed by John Deere parts, service and warranty coverage.